Thursday evening saw a major football victory in Cincinnati, though not on the field. The city council unanimously voted in favour of changes in zoning, which allow for an MLS-specific 26,000-seat stadium in the largely residential West End. Without this decision construction would be stalled and timing is important for FC Cincinnati, who are to deliver their stadium in 2021, as required by MLS. It's not the end just yet, because final design decisions are still to come. As an example, neighbours of the future arena refused to accept the distinctive orange illumination, which means the stadium will most likely remain neutral in terms of colour. This decision will not have to be approved by the council, rather within its committee. Two other issues came to a close on Thursday. One considered conflict with the city ballet, which is located within the area. The institution will lose its parking and has expressed fears of noise pollution. FCC will thus pay $1 million towards noise insulation and analysis of potential relocation. Similar settlement was reached with restaurant operator, who is forced to relocate outside West End, seeing no alternative location within the district. FCC paid her $175,000 and the city adds further $75,000. 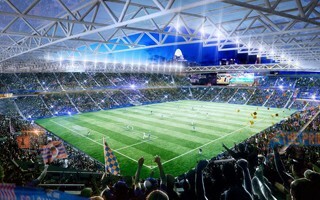 The new West End stadium, designed by renowned architect Dan Meis, will cost $250 million to complete. The club pledged to cover all construction cost, later paying $400,000 annually in admission tax revenue and $150,000 for operating municipal parking. The club also settled disputes with neighbours and will support the city's police department. The city, in turn, expects to spend $35 million in infrastructural improvements in West End.